what a great city! 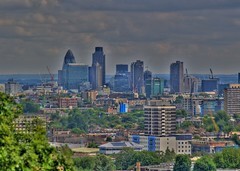 took this shot whilst looking over the city from Hampstead Heath. It is my first attempt at HDR (high dynamic range) pictures and am fairly pleased with it. It amazes me how much construction work is happening in London at the moment, just hope the famous landmarks remain visible with all the new stuff planned.